When you create an account, AccountSight provides you a pre-defined default approval path i.e. 'Project Manager Approval’. If you use the time-off functionality, you must define at least one additional approval routing as Project Manager Approval routing is not applicable to the time-off functionality. 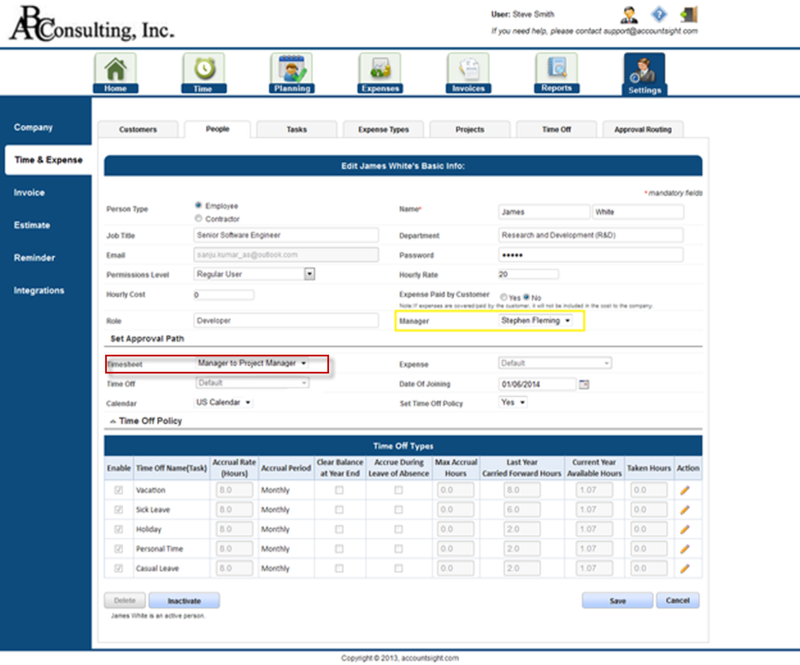 If your organization has more elaborate approval requirements, you can create multiple approval routings and assign them to the employees’ time, expense and time-off approvals. 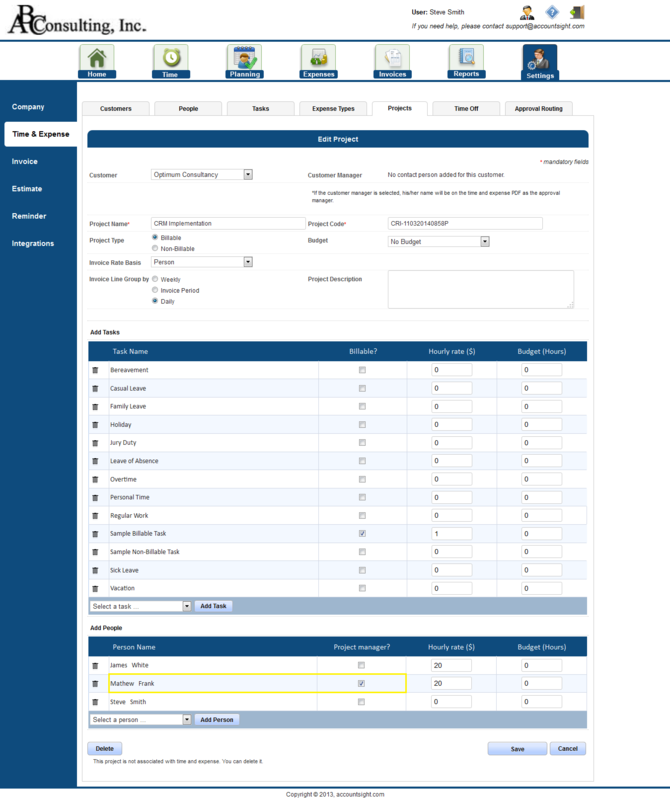 AccountSight allows you to create multiple-levels of approval (up to 5 levels). You can add a new path by clicking on ‘Add New Routing Sequence’. Select Level 1 and Level 2 approvers based on either the role or name. 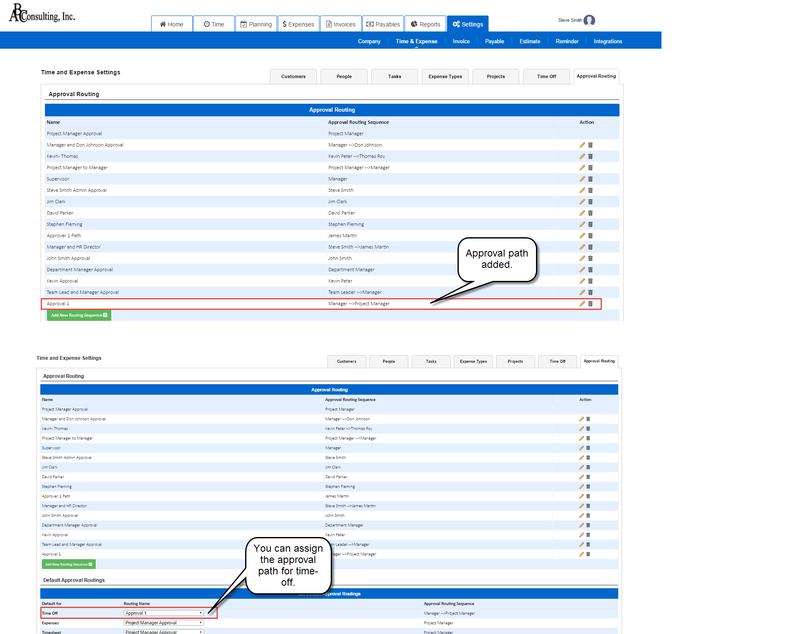 Once you select one option (Role or Specific Approver), the other option becomes non-editable. Enter path details and Save it. It is recommended to keep the Approval Routing name that will indicate the approvers in the routing. After saving, you can set this path as the default path for all users/your organization default for time, expense and/or time-off. 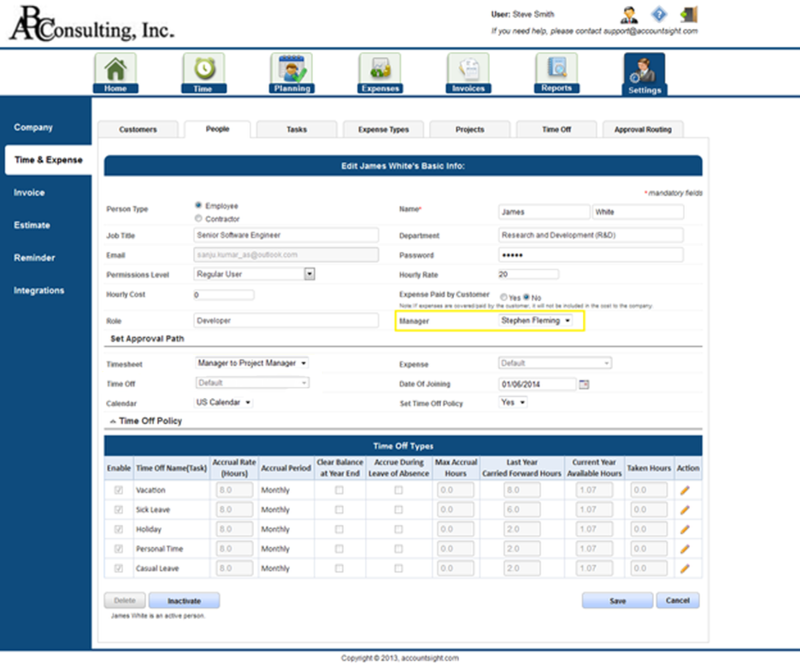 You can define as many approval routings as required by your organization. 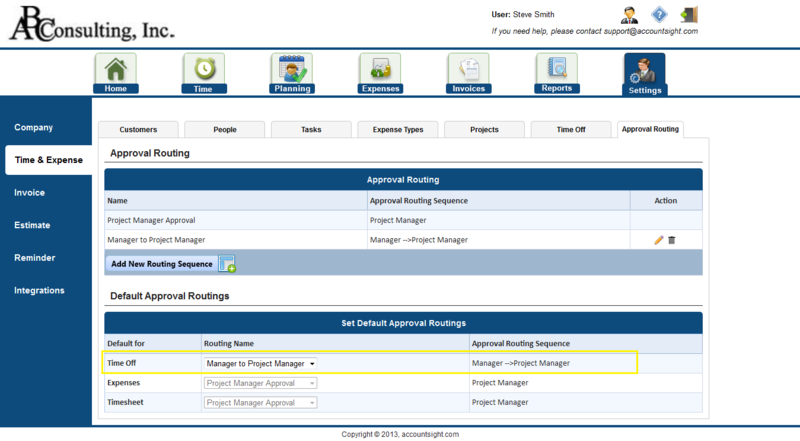 If you are using manager in the approval routing anywhere, you must setup ‘Manager’ for the employees in ‘People’ setup screen. Also, you can assign employees different holiday calendars as required. Your organization level default approvals will be automatically defaulted to each employee, but you can change the default approval routing for each employee as shown below. If you are using the project manager approval, you must assign someone as manager to each project in the ‘Projects’ setup screen. In the example setup, James White is an employee has been assigned to the ‘CRM Implementation’ project above where Matthew Frank is the project manager. As his approval path requires both the manager as well as the project manager, manager must be set up in the employee screen. As per setup seen above, James White’s timesheet entries will be approved first by his Manager (Stephen Fleming) and then by the Project Manager (Mathew Frank). Each project manager will only see the hours for his or her project due to privacy reasons.